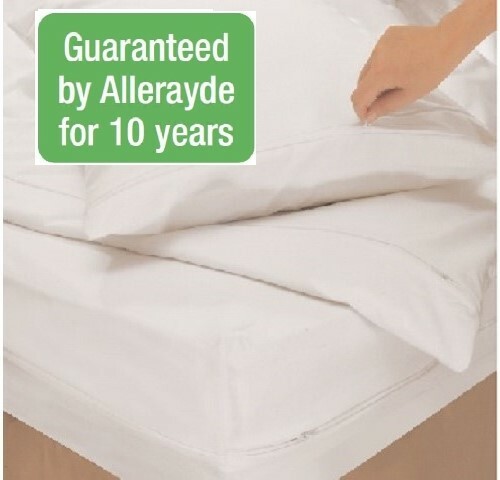 If you are replacing your old, allergen loaded pillows, our new pillows, with allergen proof outers made of a a silky soft micro-fibre fabric, are the answer. They will never be colonised by dust mites and so they will never contain their allergens. Our pillows are non-allergenic. Unlike many others there is no need for regular washing only when they become soiled so saving money and time. They should be covered with your favourite bed linen which should be hot washed regularly. Save 10% when buying two pillows! 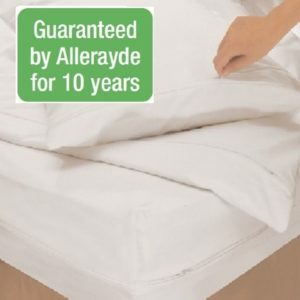 When choosing a barrier cover for your mattress, duvet and pillows, the number one selection criteria is to totally encase the bedding and thus protect yourself from any contact with the house dust mite and its associated allergen triggers. This will ensure you get relief from symptoms such as wheezing, coughing, itchy skin, runny nose and tearful sore eyes. You need a fabric that lets your body breathe - not sweat - so water vapour and air can travel unimpeded. Allerayde has been developing its range of barrier bed covers for 25 years so it knows how to achieve such a critical balance between fully effective allergen avoidance bodily comfort. So confident are we in the quality of out product, that we offer some of our longest guarantees you will find - up to 25 years! When choosing a barrier cover for your mattress, duvet and pillows, the number one selection criteria is to totally encase the bedding and thus protect yourself from any contact with the house dust mite and its associated allergen triggers. This will ensure you get relief from symptoms such as wheezing, coughing, itchy skin, runny nose and tearful sore eyes. You need a fabric that lets your body breathe - not sweat - so water vapour and air can travel unimpeded. 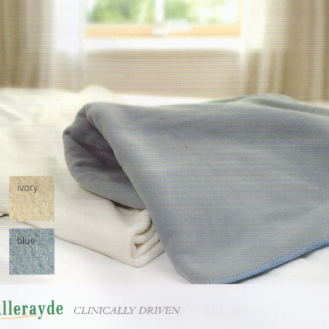 Allerayde has been developing its range of barrier bed covers for 27 years so it knows how to achieve such a critical balance between fully effective allergen avoidance bodily comfort. So confident are we in the quality of out product, that we offer some of our longest guarantees you will find - up to 10 years! Our blankets are made of genuine Polartec, the fabric that provides warmth with out weight. Air pockets in the fleece on either side of an insulation. Not only are our blankets extremely soft and comfortable, they are also able to withstand repeated hot washing and machine drying necessary to kill dust mites and remove their allergens. Quick drying and non-pilling they are tastefully finished with colour coordinated blanket stitch edging.